Playing Time: 10 - 30 min. Have you ever played a game that during game play the rules change? Fluxx gets its name due to the rules being constantly in flux. No two games will ever be the same as different modifies and objectives are use and are continually changing. Just when you think you are going to win things change and out of no where you could instantly be the game winner when it's not even your turn. With lots of different versions of Fluxx (ranging from Batman, Monty Python, and Firefly or other science fiction themes) you can find one that fits your style. Step outside the traditional rules and order of game and enter a whole to new world of changing things on the fly. Fun, engaging and challenging - Fluxx is sure to keep you on the edge of your seat. Regardless of if it's your turn or not, if you meet the conditions of the current goal you will win instantly. 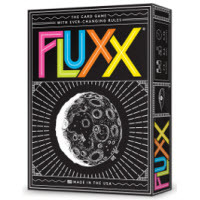 You'll get the Fluxx card pack and the official rules and instructions when you purchase Fluxx. Please keep in mind that the official Fluxx dice-card rules and instructions could be different depending on the game version you have. The rules below are some of the exact directions on how to play Fluxx. Share with us your comments, funny stories, tips, advice, strategies, creative ways to play, questions about how to play, problems with the rules or anything you want about Fluxx. All submissions will be reviewed within 24 hours. Click here to add your Fluxx comments. I love how games are always changing the rules slightly to put a new twist on things and this one literally does just that - the rules keep changing! I get so frustrated when I'm just about to win and the rules change. It does work in your favor though when you're losing horribly and then you suddenly win.